This is the first printing of the first UK edition of THE STORY OF MONT BLANC by Albert Smith. This book was published in London by David Bogue in 1853. The book measures 188mm tall x 121mm, and has 219 pages + 8 pages of ads, coloured frontispiece, b/w title vignette, 22 b/w in-text engravings, 1 smaller in-text vignette of a locket, 5 chapter heading vignettes. 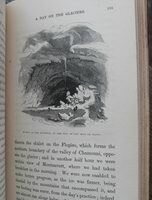 This is a history of climbing Mont Blanc and account of the author’s ascent in 1851, the 37th ascent. This was the first widely read comprehensive book focusing solely on Mont Blanc. It was popular enough to be published in both the UK the USA in several editions. The book along with Smith’s lectures had a major impact on the popularity of climbing as a sport. This first edition is highly sought, especially with the coloured frontispiece (it was also published with the frontispiece uncoloured). CONDITION: Rebound in light brown cloth with leather corners & spine, gilt lettering and rules spine. Note on EP states it was rebound in 1909. Some rubbing corners, clean, blank side of frontis has foxing and heavy soiling but the image side is relatively clean (a few tiny black spots) and quite bright compared to most, light foxing on title page and some old prices penned on the title page, minor foxing on some other pages, brown smudge marks on two facing pages (see photo), solid binding. Price: $600.